The year 1939, many critics argue, was the best year Hollywood ever had, with the release of classics like “Gone With the Wind” and “Mr. Smith Goes to Washington.” It was a busy year, too, for America’s film reviewer, Thomas J. Fitzmorris, who wrote as many as four reviews a week. Here are a few highlights from that legendary year. This article has been republished as part of America’s special 110th anniversary issue. It may be the Chestertonian function of such fantasies as this to remind us that the sort of child who does not believe in fairies usually grows up to be the sort of person who disbelieves in angels. It will be difficult to find either child or grownup, however, who will not take this screening of L. Frank Baum’s hardy fairy tale as a pleasant excursion from prosaic reality. It manages beautifully to re-create the incidents of the book with trick and technicolor and has done little violence to the story of Dorothy, who is whisked from a Kansas farm to incredible Oz by the whim of a cyclone. Her adventures in company with the Straw Man, the Tin Woodman and the Cowardly Lion on their way to petition the great wizard for what they wish most are zestfully reproduced. 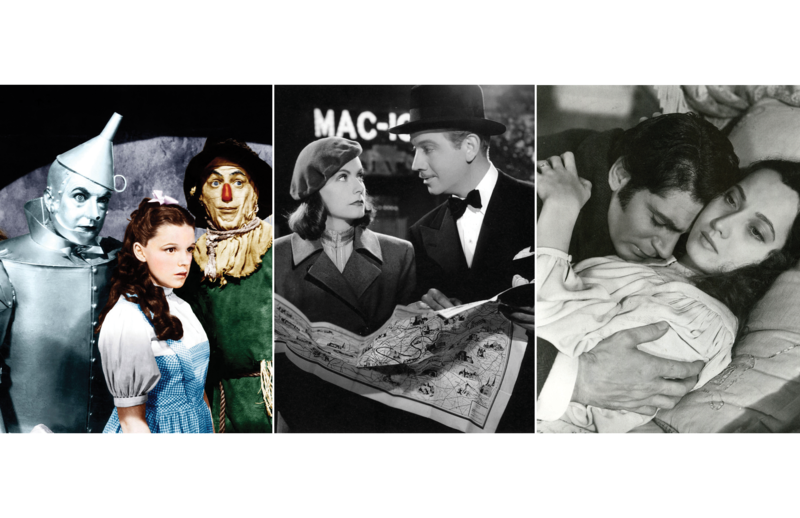 Director Victor Fleming has visualized the antics in such ways as to vivify rather than distort fond recollections and Judy Garland adds tuneful music to Dorothy’s original charms…. To say that this film will please all Oz readers may be overstating the case, but it leaves room only for carping by its imaginative production and infectious good humor. The sly thesis involved in this sparkling film makes the point that the most difficult thing about the theory of Communism is its practice. It is a literate, satirical slap on the wrist for the comrades which, though coming at a time when the ideology is being heavily bombarded, is nevertheless encouraging as emanating from Hollywood, long a stronghold of nouveau riche radicalism. Under Ernst Lubitsch’s facile direction, it spins out a gay yarn of the Soviet’s attempt to raise ready money on some expropriated jewels through three emissaries in Paris. When the trio is demoralized by capitalist high life, a female agent is despatched to take over, but she, too, is lured from the path of duty to the proletariat by an agent of the duchess who formerly owned the gems. She returns to Russia but with a romantic entanglement which is subsequently confirmed in Constantinople. Bourgeois courtship wins an easy victory since love, which laughs at locksmiths, is undone by Soviet openness, epitomized in the film by partitioned rooms and censored mail. By juxtaposing theory and practice, Lubitsch has provided a jesting moral which whittles down much of the solemn hokum about life in the workers’ paradise. Greta Garbo essays the lighter form of drama with brilliant success and Ina Claire shares the expert handling of bright lines. This is excellent adult humor with a prime object for satire. Although Emily Brontë’s conte-mporaries, used to reticence in women novelists, mistook this almost inhumanly imaginative work for a man’s, we see it unfold on a screen, straining to capture its authentic spirit as the natural product of a wild, solitary and enigmatic woman, whose knowledge of life and love was subjective and who identified the male of the species with a hurtful, Hardyesque Nature, such as glowered over the north English moors surrounding Haworth parsonage. This film is a masterly re-creation, retaining the sensational plot, the Gothic characters and the essential naivete of the motivation, along with passages of genuine, brooding emotion. The strange romance between the fanciful, irresolute Cathy and the gypsy Heathcliff, brutalized by condescension and abuse, is interrupted by her marriage without love. But years later, as a rich man, Heathcliff takes a stableboy’s revenge on Cathy’s sodden brother and harries her to death at the birth of her son. His mechanical torture of his own unloved wife and his nightmarish quest for Cathy, ending in his death, compose a psychopathic study which is as gripping as it is unsound. William Wyler has caught the moods brilliantly, and the impressiveness of the tale is enhanced by an equally imaginative production…. As Emily Brontë was unorthodox, so the film arranges a posthumous rendezvous for Heathcliff and Cathy, which apotheosizes their false fidelity in a flush of immoral sentimentality, and this breach, together with the morbid revenge motif, makes even adult recommendation precarious. James Hilton’s rediscovery of the novel of sentiment has conditioned a vast public for this masterly photoplay’s quiet, yet insistent, charm. It is decidedly not just another play on the heartsstrings, being distinguished by the quality rather than the quantity of its pathos. Sam Wood has contrived to annotate an obscure destiny without allowing Mr. Chips to fall into his anecdotage; the teacher remains a natural figure in a typical public-school scheme, but the man is a complete revelation of human nature’s graces. The action is not noticeably episodic although it carries Chips from idealistic young manhood to aged wisdom through three generations of Brookfield boys. Out of touch with pupils and masters at first, he loves and loses a young wife by death and is subtly transformed by the happy interlude, emerging finally a gracious old man who carries on for the old school during the blighting days of the War. The good instinct which led the producers to do this film in England is justified by the authenticity of the academic backgrounds and the essential rightness of the casting. Robert Donat gives a remarkable demonstration of his splendid range of feeling and execution and is a Chips to satisfy even reverent readers. Greer Garson, as Kathie, plays admirably in key and the production is eminently worthy of a fine original. This is obligatory entertainment for all. That was a great year for hollywood. Many movies were released and many got huge collection at box office. Now one can watch all latest movies, TV shows and series for free on Android and iOS devices using Cinema apk. All time favorite movies and tv series from 1939. Thanks for share this post. This article also appeared in print, under the headline "A legendary year in Hollywood," in the April 15, 2019 issue.